Sponsored by the Association for Education Finance and Policy (AEFP), this groundbreaking new handbook assembles in one place the existing research-based knowledge in education finance and policy, thereby helping to define this evolving field of research and practice. 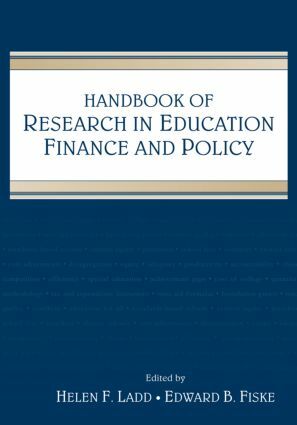 It provides a readily available resource for anyone seriously involved in education finance and policy in the United States and around the world. The Handbook traces the evolution of the field from its initial focus on school inputs and the revenue sources used to finance these inputs to a focus on educational outcomes and the larger policies used to achieve them. It shows how the current decision-making context in school finance inevitably interacts with those of governance, accountability, equity, privatization, and other areas of education policy. Because a full understanding of the important contemporary issues requires input from a variety of perspectives, the Handbook draws on contributors from a variety of disciplines. While many of the chapters cover complex state-of-the-art empirical research, the authors explain key concepts in language that non-specialists can understand.